Date: January 9, 2014 Author: Jim Froling Categories: January 2014 Resolutions and BlogNo comments yet. [schema type=”organization” orgtype=”LocalBusiness” url=”http://949local.com” name=”(949) Local Internet Marketing” description=”Internet marketing for small business in Orange County, CA” street=”26040 Acero” city=”Mission Viejo” state=”CA” postalcode=”92673″ country=”US” email=”info@949local.com” phone=”(949)573-2125″ ]HAPPY NEW YEAR!…Now get to work!! As 2013 came to a close did you ponder the course of your business over the the past year? Did you say to yourself, “Thank God I survived” or “Thank God I thrived”? Whichever way you answered, I hope that you considered your actions that contributed most to your survival or your growth. I hope also that you began to formulate a plan for 2014 that builds upon those positive actions of last year and incorporates a few new actions to take your business to the next level. No doubt you will get a lot of strong advice both online and offline from business “gurus” telling you to do (or don’t do) this or that in the year ahead. I suspect you will be relieved to know that I’m not going to do that. Instead I’m going to tell you what (949) Local is going to do to survive and thrive in 2014. If my planned actions resonnate and you decide to add them to your own plan, great! If not, that’s fine too. After all, everyone’s plan should be unique to themselves and their own circumstances. I’m not much different than many of you reading this now. I run a small business and was blessed that it thrived as more clients entrusted us with their online marketing in 2013, most of whom were referred from other satisfied clients. And we were also blessed in being able to perform for them despite some very challenging twists and turns presented by the search engines and “You Know ‘Goo…’” in particular. Now as 2014 dawns, we think of how we want to continue to grow in this new year and how we’re going to do it. We’re Going to Get More Online Reviews! Brace yourself. A digital marketer is going to confirm what you already know: “Word of mouth is the best marketing tool for your business”. And mine too judging by the referrals (949) Local received last year. As much as I appreciate referrals, I need to channel them and promote them as well, especially online. In a survey done last June by Myles Anderson on SearchEngine Land, 79% of consumers say they trust an online review just as much as they trust a recommendation by a friend. I am, however, a little shy about asking clients for their referral, even online. And, in the past it hasn’t always been very easy to direct (channel) them to the review site I desire e.g. Google, Yelp, etc. One of the best new tools we adopted (for our clients anyways) is one which sends an email out to recent customers which asks a few general questions on their recent experience. If the customer replies with positive ratings another email is sent to thank them and asks one more small favor: Now go to your favorite review sites and tell the world. “Buttons” are embedded in the email that will take them directly to the client’s page on Google+, Yelp or any other review site we want to channel them to. If, however, their rating of their experience is less than stellar it gives us the “heads up” and we can then personally reach out to the customer to address their concerns directly, before they post a negative review online. Then, when the customer is satisfied, their feedback is requested again and once we are reasonably certain that their previous concerns are resolved and they are now satisfied, direct them to our pages on various review sites. Voila! We gain valuable feedback, build additonal goodwill and get a marketing boost. Talk about turning a negative into a positive! We’re Going to Be More Active on Social Media! So many clients and local business owners we know groan and moan when this topic is brought up. I get it! I too find it challenging to set aside even a small amount of time to go to my Facebook or Google+ Page and write something relevant and interesting. However, one key development in local search in the past year is a business’ activity, and online interaction in social media. So if our postings on Google+ will improve our search rankings throughout Orange County, I’ll make the time. Some clients tell us they just can’t think of anything worthwhile to write (or post) on. I had the same challenge. Then I started visiting the groups I belong to on LinkedIn relevant to Orange County business and my business and found opinions that I either agreed with or not. I replied to posts there and more important, the online discussion helped crystalize my thoughts on the topic so I could share them on other platforms like Google+, Facebook, the (949) Local blog and our newsletter. We also set up alerts on Google to tell us whenever something relevant to my business was found online. Every day my Gmail delivers new announcments, opinions and happenings in my business and my community. Yes, a lot of it is self serving PR releases but also a lot of good discussions that I can weigh in on. This helps keep my social content fresh (and therefore more relevant) and helps position me further as an expert in my field and my community of Orange County. We’re Going to Advertise More Online! Not unlike the topics above, this too pleads, “Oh doctor, heal thyself!”. After all, we are in the search marketing business and constantly trumpeting the vast advantages to Google Adwords. And, if I do say so myself, we’ve gotten pretty darn good at crafting high performing and measureable campaigns. There (you better) see (949) Local positioned at the top of the local search results. We have a lot of clients that found us this way. 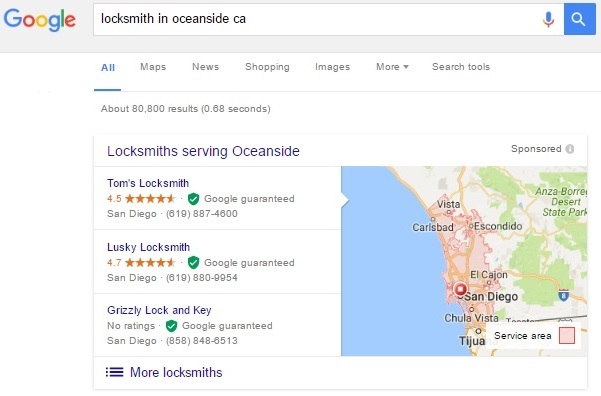 However we work in a field with lots of local competitors and we will never rank over another online marketing company, say in Irvine, when someone specifies Irvine in their search query. There are just too many local competitors between here and there to expect to rank in that “local pack”. That is where Adwords comes in. We can get Page One visibility in Irvine or any other communities we desire with our message plastered at the top of the page of search results on queries (or keywords) that we want. We set our daily budget so we don’t go broke in the process. We craft numerous ads to determine what prompts folks like you to call us. When one works, we run with it. When one doesn’t, we dump it. We constantly monitor, adjust and experiment with the ads themselves, the keywords that trigger the ads, the bid amounts, etc. etc. etc. It, like most online marketing, just takes time to perfect. We’ve run a number of campaigns over the past year which have performed very well. It’s true, search marketing (Pay-per-Click or PPC) can be really expensive if you don’t stay on top of it and know what you’re doing. But with more clients using us to manage their online campaigns, we spent more time optimizing their campaigns than we did on our own. So, we are confident that we know what we’re doing. Just not that confident that we will dedicate the time necessary to manage it as effectively as we do for our clients. However, we’ve invested a lot over the past year in a number of software tools to help us execute better for our clients that improves performance while saving us a bunch of time. That bunch of time will be allocated to promoting our business effectively, fine tuning the execution of processes on our client’s behalf and growing (949) Local overall in 2014. Those are three things that we are resolved to do in 2014, so consider yourself forewarned. If you are a client, expect us to hit you up for your feedback and a online review. If you are a Facebook “Friend” or in our Google “Circles”, expect to see more compelling and engaging posts to get your mind turning. And if you find yourself in need of some help in navigating the increasingly complex waters of local Internet marketing and don’t immediately think of (949) Local (shame on you! ), expect to see us at the top of your search results page on Google when you go there to find help. We believe that 2014 is going to be a great year for (949) Local, our clients and all local businesses. Let’s resolve to thrive, and not just survive, together. Give us a call if we can help or you just want to bounce some ideas off us.